New Melbourne Browncoats, Inc. | Start the new year off right with an NMB Membership! What better way is there to kick off the new year than becoming an official New Melbourne Browncoats Member? 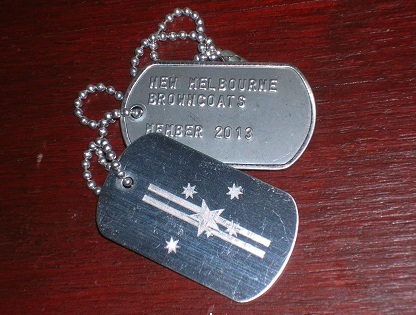 One of the coolest things about becoming a member is that you will receive a set of exclusive New Melbourne Browncoats dogtags. One bears the logo of the New Melbourne Browncoats, and the other is stamped with the year of membership. And you’ll get a new yearly tag each time you renew. Members are also eligible for our monthly Member Prize Draw, which features some very cool Browncoat themed prizes for a lucky randomly selected member each month. Plus many other exclusive benefits from our supporters throughout the year, such as giveaways and discounts. Memberships are for 12 months, effective 1 January each year (regardless of purchase date) and cost just $16 for new members (up from $15 in 2014) and $11 (up from $10 in 2014) for renewing members. Running a club like ours isn’t without expenses, and in order to put on charity fundraising events like Can’t Stop the Serenity, social days, our Outfitters Charity Booth at conventions, and so on we need some help. This is where you come in. Buying a membership will help us offset the cost of these events and activities, as well as ensure that we have money ahead of time to pay for the up front costs that come with organising events. Membership income also covers our Public Liability Insurance, and other costs like bank fees, postage etc. We try to keep our expenses as low as possible and the volunteer committee will never pay themselves for their time (we even buy our own tickets to events we run!). So you can rest assured that the full amount of your membership will go directly towards paying our running costs, helping us to donate as much as we can each year to a range of charities (over $40,000 since 2011). How do you become a member? Head over to our Membership page for all the info.